This cute little owl and his friend the spider are just hanging out on the moon, waiting to be spooky and fun in your Halloween decor. The free pattern is from Jacquie Morris at her My Journey blog and makes for a quick and easy stitch. You’ll also find a few other Halloween themed freebies on the same page [here]. A pirate ship with a giant bat sail sailing your way courtesy of Too Much Stash just in time for Halloween stitching. You’ll find the pattern as a JPG downloadable from Joobee at the Too Much Stash blog [here]. It’s actually a little amazing how many Halloween elements are incorporated into this itty bitty Boo cross stitch pattern from Plaid. There’s the standard orange, black, and yellow colors. Bats. A pumpkin carved into a jack’o’lantern. Candy corn stripes. All that and it’s only about two inches big, and darn cute. You’ll find the pattern at PlaidOnline.com [here]. With all whole stitches and a tiny bit of backstitch this is a beginner level project that can be stitched up quickly in time for Halloween. Just the right size for an ornament or a card. Witches, Skulls, and Bats, Oh My! DMC’s Commonthread shared four PDFs packed with Halloween goodness. Cute witches, fun pumpkins, spooky little bats and spiders, there’s even a cute little owl. You’ll find all four pattern set PDF files on the Commonthread site [here]. 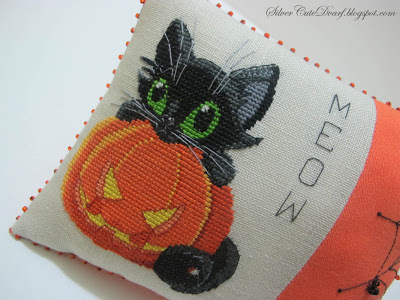 This cute little cat and cauldron freebie is from Stitchers Anon and can be found here. A quick little stitch with just a few colors and basic whole stitches, perfect for a Halloween tree or grouping of decorations.